Find hotel near St. Mary's Church, Chilha .. Always buzzing with life, the St. Mary’s Church in Chilham is one of the five churches in the Kings Wood Benefice. Trivia- the church is famous as the last known resting place of the shrine of St. Augustine. When the Abbey of St. Augustine in Canterbury got destroyed during the English Reformation, the shrine containing the saint’s body was removed from the abbey and brought to this church. It stayed here until 1541 after which it disappeared! Several attempts to determine what happed to the shrine have proved unsuccessful and till today, its whereabouts remain a mystery. It is recommended to visit between 09:00 am. to 04:00 pm. How popular is St. Mary's Church, Chilham? 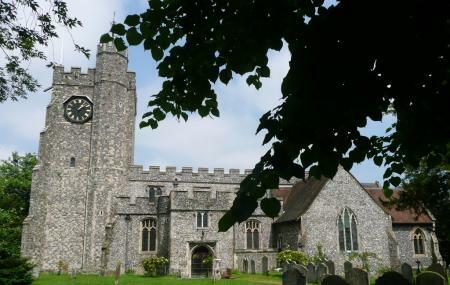 People normally club together Chilham Castle and Dane John Gardens while planning their visit to St. Mary's Church, Chilham.